Whether you’re looking to improve your own health or the health of the planet, one of the best ways to start is by swapping some of the not-so-good nutrition choices for the ones that really benefit us and everything around us. With more of us looking at being a little healthier, more active and building on our strength; protein has become a bigger part of our daily diet now than ever before. If you’re turning to protein powders and processed energy bars though, this isn’t really doing you any good on the inside as you’re likely to be consuming a ton of chemicals and sugar too. With almost twice as much fibre as most other grains, all nine essential amino acids, and a high iron content – meaning it helps to increase the rate of oxygen in our circulatory system and also helps to keep us feeling energised. This grain-like seed is a complete protein, and is actually one of the highest sources of protein we can consume! Use it in place of rice, pasta or at breakfast as an alternative to porridge oats. These little seeds contain heart healthy fats and are great source of zinc, which helps to maintain a strong immune system and can also aid in the quick recovery of colds. Pumpkin seeds have been proven to reduce a lot of the symptoms pre-menopausal women may experience, and as well as their high protein content, they contain tryptophan which both aids in good mood levels and better quality sleep. A true superfood, Chia seeds are full of omega-3 fats and fibre, as well as calcium, phosphorus and manganese. Chia seeds help to stabalise blood sugar, and are super filling. When chia seeds are mixed with a small amount of water, the outer layer swells to form a gel-like substance. When used in this way, chia can be used as an egg replacement; just mix 1 tablespoon of chia with 3 tablespoons of water and leave to set for 15 minutes to form your ‘chia egg’. Chia seeds can also be easily added to smoothies, museli and porridge. An unlikely candidate when looking for a protein punch, broccoli is supremely underrated powerful plant. Broccoli contains higher amounts of calcium than most dairy products, and is great for detoxifying the skin and boosting liver function. Add steamed broccoli to brown rice, toasted sunflower seeds and a splash of gluten free soy sauce for a quick, simple and nourishing lunch or dinner. Probably the most commonly suggested vegan protein option as a substitute for meat; beans are full of fibre and water, which makes them filling while also being cheap to buy! Contrastingly, meat contains no fibre what so ever! Beans are high in antioxidants and magnesium, which helps to prevent headaches and migraines. Black beans and black-eyed beans are particularly high in protein. Add them to salads for a filling lunch that will also give you long lasting energy. Aiding digestive health (which is more important to our overall health than we might think), and great for stabalising blood sugar. Packed full of vitamins and minerals such as iron, zinc, niacin and vitamin k; they are extremely nutrient dense – which means a serving of these filling lentils can only be good for you! Red lentil soup is a super cheap, filling and healthy meal and is especially comforting during Winter. This has to be one of the best meals to add to your cook book if you’re at university to keep you going in those frozen student houses! Such a good source of protein, you can now buy ready-made pea protein to add to smoothies (although it’s always best to stick to natural and completely unprocessed foods instead of protein powders). They’re brilliant to help fight inflammation – which is responsible for arthritis, osteoporosis, and alzheimer’s. One more reason? Once peas have been harvested, the remaining plant breaks down naturally to help create more organic fertiliser for soil. Peas can be blended and added to other ingredients like mint and non-dairy yoghurt to make a refreshing and healthy dip for a healthy snack with carrots and celery. Containing vitamin E, which is important for protecting artery walls – sunflower seeds also contain good amounts of magnesium, which soothes the nervous system. These powerful little seeds also contain tryptophan, which when consumed, is then converted in to the positive neurotransmitter serotonin. This basically means that sunflowers are useful for putting us in a good mood! Easily add sunflower seeds to your day by munching on a handful of them as a snack, add them to soups and salads, or knead them in to dough if you make your own bread at home. As well as being an aphrodisiac, asparagus is another unlikely protein source. With elements of chromium, asparagus is great for ensuring blood glucose levels are kept stable, stopping us from craving sugary snacks. Because of its bright green colour, asparagus provides us with folate, which works with vitamin B12 to improve cognitive function, mood and energy levels. Use asparagus spears in place of bread for a distinctive and healthy alternative to dip in your boiled egg, or lightly steam or roast them and add to salad or raw, vegan pizza. Hemp Seeds **Favourite source of plant based protein! Hemp helps to reduce cholesterol levels, can alleviate symptoms of depression, aids in clearing skin problems such as psoriasis or eczema, controls blood sugar levels, and boosts energy and endurance levels dramatically. Hemp seeds are filling and contain all nine essential amino acids so they’re a dense source of nourishment. They can be added to smoothies, soups, sprinkled on salads, in salad dressing, added to home made granola, or mixed in to non dairy yoghurt with fruit for a quick and healthy snack. 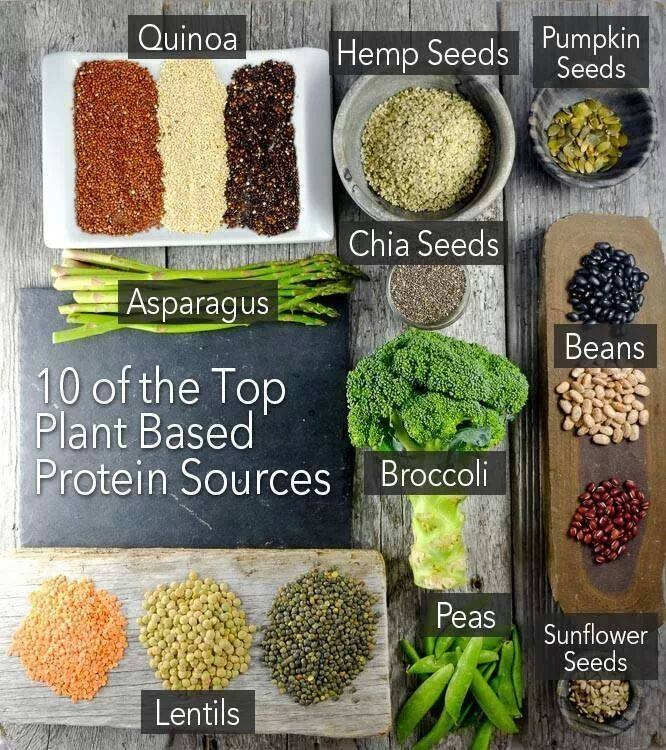 So there you go; try out some of these plant based sources of protein and notice just how much they benefit you from the inside out!